A workshop facilitated by Barbara Bickel as part of the Holistic Education Special Interest Group of the American Educational Research Association. 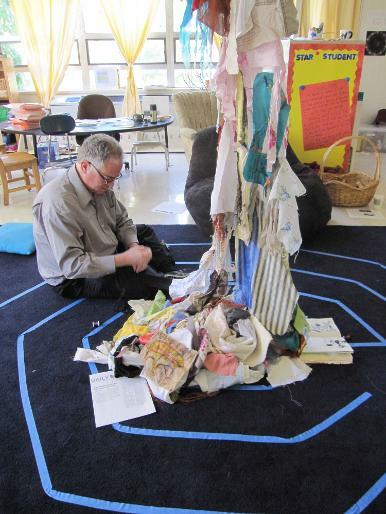 The workshop took place at the Waldorf School in Oakland California. 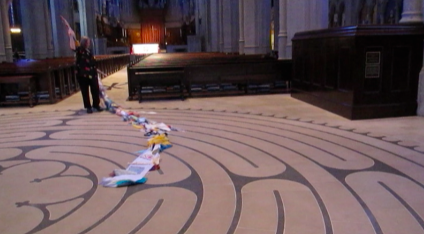 Before leaving California Barbara took the Dream Scroll to the Grace Cathedral Labyrinth and invited those still in town who had attended the Nap-In to join her there. 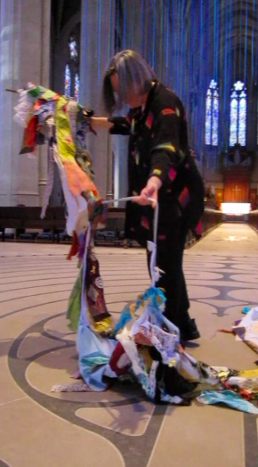 Grace Cathedral is the home of the North American labyrinth revival movement inspired by Lauren Artress. It has been a tradition of the Nap-Ins to hold some form of ritual releasing of the dreams back into the world, to the elements from which they came. It seemed fitting to take the Dream Scroll to the cathedral labyrinth. A pilgrimage of sorts. 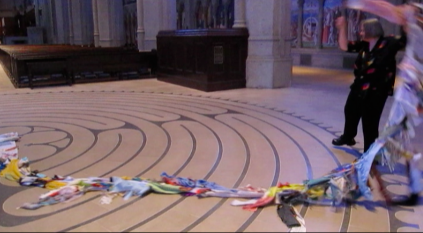 Two women would join Barbara at the indoor cathedral Labyrinth. The cathedral had hundreds of blue ribbons hanging from the high ceiling over the pews, creating a magical blue haze in the grand space. The organist was practicing on this quiet Tuesday afternoon and organ music permeated the cathedral. Barbara walked into the labyrinth on her own holding the Dream Scroll like a baby in her arms. She did not know what would happen when she arrived at the center. Just as she reached the center the two women from the Nap-In joined her. It was decided one of the women (Marna) would walk out of the labyrinth and unravel the Dream Scroll as she walked the path out. Barbara video documented this walk out with her small camera. Marna began unrolling the dream scroll, humming and swaying as she moved through the labyrinth. 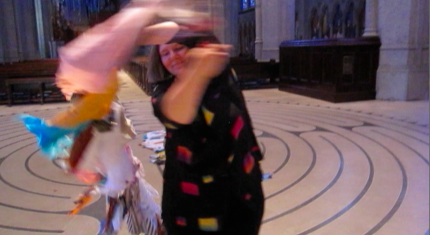 A beautiful dance unfolded in the sacred space. Just as the tail tip of the Dream Scroll was exiting the center of the labyrinth a church worker interrupted them and asked them to stop. The process on the labyrinth being enacted she said, was not what the labyrinth was to be used for and would stop others from walking it. At the time, there were no other people in the cathedral. 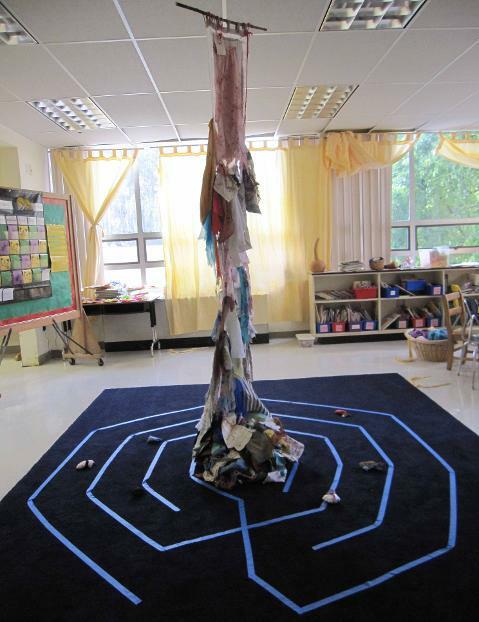 The work that Lauren Artress advocates for with the labyrinth is about answering its ancient call and walking a path of compassion. 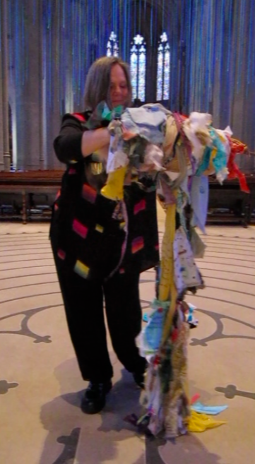 This was the first time the Dream Scroll had been brought to an indoor venue to release its dreams. It is interesting to note that the gathered collective Dreams being danced and sung out of the labyrinth by Marna were stopped at the moment they lost contact with the center of the labyrinth. Barbara was not able to watch the video for three months after this experience. 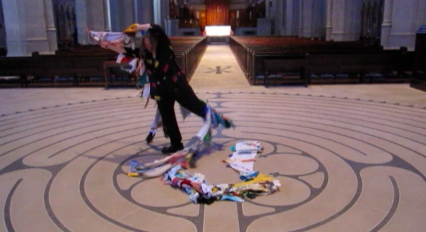 It was in watching it in slow motion three months later that she saw the connection between the tail leaving the center occurring at the same time they were told by the church authorities to leave the labyrinth. 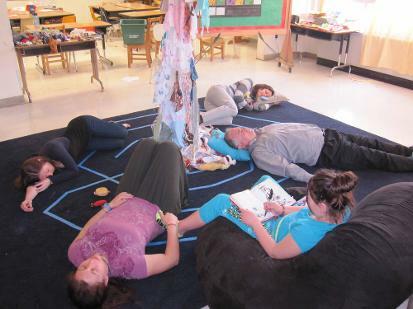 The center of the labyrinth is the symbolic womb center of the labyrinth, where a clear connection with the Divine is often sought and found. Metaphorically it is reminiscent of the umbilical cord procedurally cut too soon in western medical births before the mother and child have completed their full exchange through the placenta. 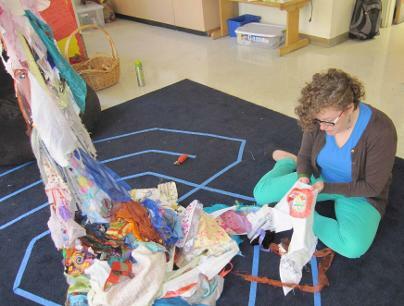 Barbara had been in an altered co-creative state wit(h)nessing the labyrinth and Marna. The abrupt interruption by the church women shook her and left her deeply saddened. 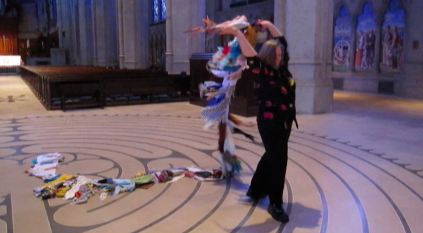 It did not feel insignificant that the women church workers felt the need to halt the spontaneous co-creative expression on the labyrinth for fear of the future possibility of someone entering the space. Marna reflected afterwards on the history of the persecution of wise women (witches) by the church. The journey that was enacted by Marna and Barbara was not closed to others that might enter the cathedral. To have the walk/dance aborted for fear of excluding others felt like the rejection of Divine spirit in its creative essence. A month after this experience the Dream Scroll was taken by the Gestare Art Collective to the University of Victoria in BC, where they had given a presentation on their journey with it thus far. 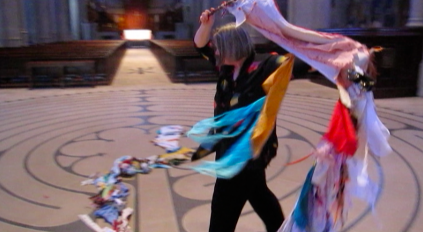 Barbara had thought to return to an outdoor Anglican Cathedral to complete the aborted walk as a form of healing and cleansing of the experience. What occurred in its place was an airing of the dream Scroll on a beached log on the shore of the Pacific Ocean. The elemental source of life in the form of the sun, wind and water called more lovingly as a healing site than a church. The sun heated ocean air permeated its many dreams. In viewing the photographs taken during this cleansing ritual by the Gestare women, they recognized a resemblance with a ship's crew-- mending their ship sails for future sailing. 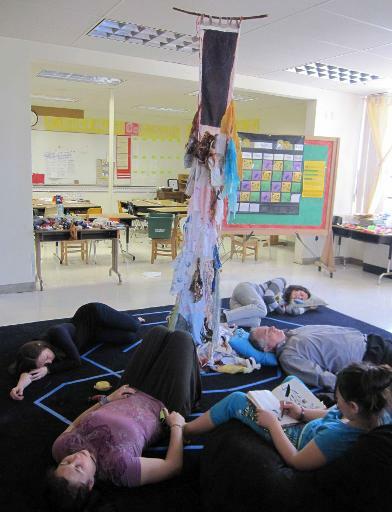 The journey of the Nap-Ins and the Dream Scroll has taken on a life of its own since its inception in July of 2011. The collective continues to be the carrier of the dreams while the work of building compassionate re-attunement with each other and spirit is needed.